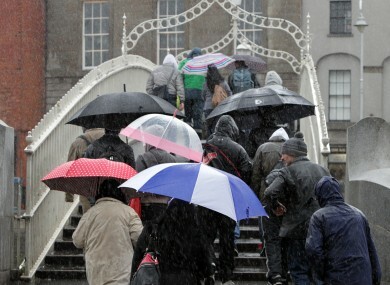 Karl Melhorn of the Irish Weather Network says to expect rain today. Lots and lots of rain. THURSDAY IS GOING to be a wet and windy day in most places with Leinster and Munster and parts of Ulster receiving heavy rain turning persistent later as an area of low pressure moves in from the south west. Low cloud and hill fog will form around the coasts during the morning. Winds will increases early on Thursday with rain arriving on the south west coast around 9am. This rain accompanied by strong southeast to east winds will extend into Munster and south Leinster during the rest of the morning and make its way steadily northwards. The rain is likely to become heavy and persistent especially through the south and east with winds possibly reaching gale force for a time on the southwest and later eastern coasts. Rainfall amounts of between 20 to 30mm is possible in Leinster and parts of Munster with driving rain at times making for poor visibility and driving conditions. Rainfall amounts of 40 to 50mm possible over higher ground again in the east and south of the country with rivers swelling in places. Through the west, rain won’t be as heavy as in the rest of the country but it may be persistent for a time. The north will see rain arrive in the early afternoon and will also be heavy in places more to the east of Ulster in particular. A cold day with all the wind and rain about with highest values of 10 to 14C. Overnight on Thursday, it may still remain damp with outbreaks of rain continuing in the eastern half of the country and first thing on Friday morning. Karl Melhorn is the founder of the Irish Weather Network. Follow on Twitter @Irelandsweather. Email “Weatherwatch: Get the anoraks out – there’s a lot of rain coming our way”. Feedback on “Weatherwatch: Get the anoraks out – there’s a lot of rain coming our way”.